Ha Pla occupies a secluded stretch of sand along Ko Kho Khao’s central area of beach, and if looking to avoid the sprawling resorts and stay at a true mellow beach spot that’s not lacking in style, Ha Pla is a great choice. Ad Book now! Rates from US$52.46++. Average rating 9.1 from 245 reviews. The small restaurant area, which doubles as a lobby, is set under the shade of coconut trees with the sea in clear view. It’s one of the more relaxed areas to while away your time with a cocktail and is worth checking out even if you’re not staying here. All of Ha Pla’s cottages are spacious, and simple but stylish with sliding glass doors on to large front porches with solid tables and chairs, soft lighting, comfortable beds with fresh sheets, and large, modern hot water bathrooms. All come only with fans, but despite being tucked back a short walk from the beach they are designed for air flow and stay pleasantly comfortable. Spectacular at sunset. We didn’t have much luck contacting them by phone or email before our visit, but it is possible to book online in advance. Ha Pla runs only during high season, November to May. 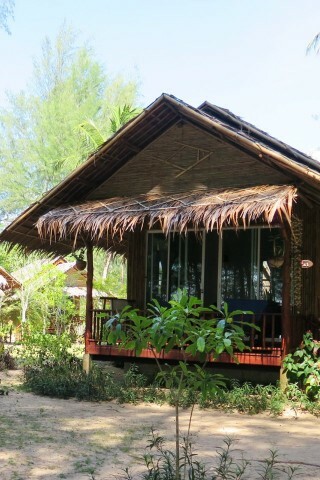 Check rates at Ha Pla Beach Cottage on Booking.com. Where are you planning on heading to after Ko Kho Khao? Here are some spots commonly visited from here, or click here to see a full destination list for Thailand.